Hello everybody who read this thread! I realize that their are many posts on this forum reference to coolant leakage, however I'm going to add one more. I have a 2000 GT (4.6) and noticed some coolant on the garage floor the other day. I have pressurized the system and there is clearly a leak; however I cannot find it. What I have found is that coolant is running onto the floor on both the drivers side and passenger side of the car near the bell housing/oil pan. It is running down onto the steering bar (not sure what the official name of is). Seems to be heavier on drivers side, but clearly is running down both. I have read a bunch of postings reference to the intake manifolds leaking and looked at the common leaking area, thermostat housing. I believe that mine is a replacement intake because it has an aluminum cross beam in the front that the alternator brackets are screwed into. I have looked all over and due to the tight spacing of the engine, I cannot locate the leak culprit. Need help/advise. I changed the oil and it doesn't appear to be contaminated with coolant and the coolant doesn't appear to be contaminated with oil. I forgot to add that there is also a coolant puddle in the valley of the engine that you can see from the front of vehicle, and a small drop of coolant under the thermostat housing. When you say coolant on the floor, do you mean its actually inside the car, and theres coolant on the carpet? and the puddle in the valley sounds like the tube that runs from the water pump and into a hose and then into the heater core (someone correct me if im wrong) unless your manifold is cracked somewhere. and the aluminum crossing might not be a replacement. Mine came from the factory like that. There is a collant tube that runs down the valley and it's o-ring seals could certainly be leaking. Or the hose itself. You also may have a leaky intake gasket. There is a hole in the back of the valley and that's how it is draining down the bell housing. The coolant is not running inside of the vehicle, I meant it is running onto the garage floor. Still looking for the problem. About to pull the alternator to get a better view of under the manifold. The coolant tube your as speaking of is the one that runs from the water pump, correct??? What o- ring seals are you speaking of? Where is the hole in the back of the valley? I can see wetness on the drivers side of the block more than on the passenger side. Well I would guess bad gaskets or a crack in the manifold. Either way it'll probably have to come off, so I would just go ahead and pull it. 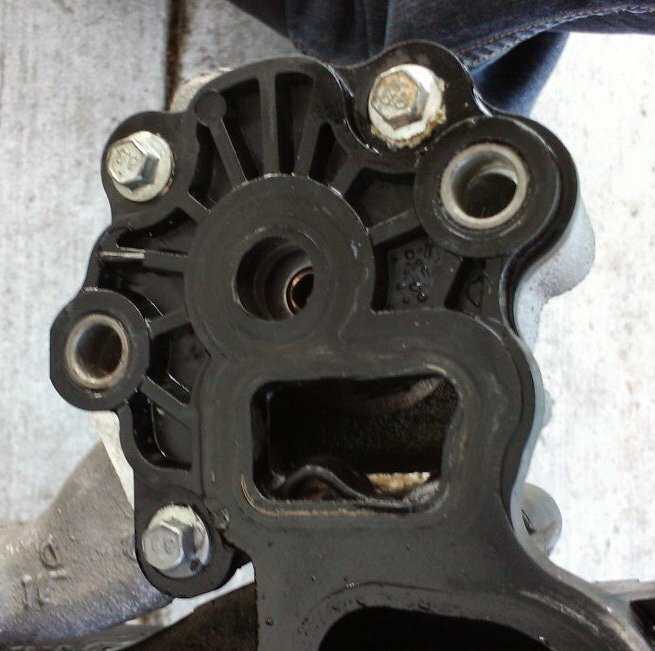 The classic failure mode for the OEM intake manifolds having the aluminum crossover pipe is that the molded channel at the juncture of the crossover and plastic spacer/flange of the manifold erodes and the formed gasket no longer seals properly. After taking off the intake manifold and gaskets I located the source of the problem. The gasket on the back left side was not sealed (probably whoever replaced the intake did not torque it in order). I also found a couple of small leaks from things not being tightened properly. While I had the intake off I replaced the heater hoses, however not sure why I did not replace spark plugs ... so I guess I have another job to due in the near future. The garage floor has been dry under the car and I no longer am losing coolant pressure.